The quietest electronic dog door unit on the market. The Plexidor Electronic Unit can be installed on house doors, walls, and now Glass surfaces such a glass pane and sliding glass doors. For any Cat or Dogs up to 125 lbs. Comes with 2 – 12 inch range keys, 1- Long Range Key, Power Supply, Surge Protector, and a Five year Warranty. 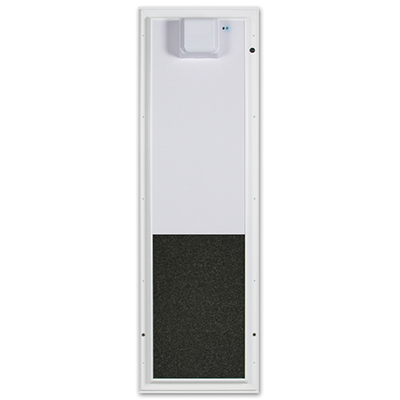 This Door Provides Security and Pet Access Control Units For Doors and Walls. 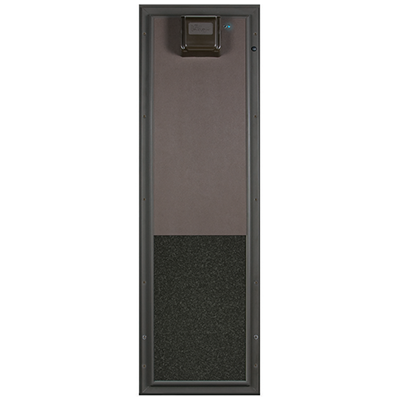 Plexidor Electronic Doors allow access only to pets wearing the RFID key. This Door is raccoon proof. It can be mounted to Glass surfaces. How it Works: PlexiDor Electronic “reads” the key code on the RFID key and opens only for your pet. Panel unlocks and slides up like a mini garage door. 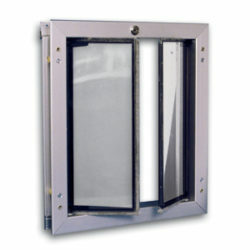 The main frame has a low profile of just 1 5/8″ in thickness. Door plugs into household outlet or can be hardwired. 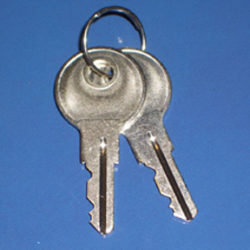 Secure-Interior stainless steel locking bar, thousands of key codes. Opens only for your pet. Tough shatter resistant panel. Heavy, thick aluminum frames that won’t bend. Won’t interfere with home security systems. Energy Efficient-No Gaps for air infiltration, saves you money. Pet and Child Safe-Panel won’t close when obstructed. Total control up and down. No pinched tails. No pinched fingers. Panel will not free fall with power failure. 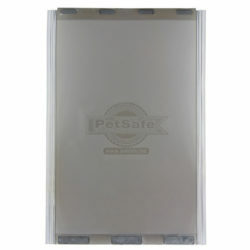 Durable-Steel and hardened aluminum frame with thick acrylic closing panel. 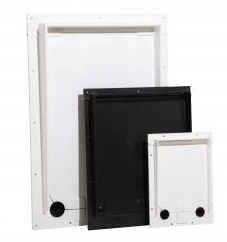 Wall units include aluminum tunnel pieces and stainless steel mounting hardware for years of service. No unsightly rust streaks on your home. Easy to Use- One button programming to add or change collar codes quickly and simply. Collar key snaps on easily and stays on. Comes complete with pet door, exterior trim, stainless steel hardware, 2 collar key pendants, and power supply with 6 ft cord. GET MORE SOUND OF MIND WITH A LONG RANGE PDE KEY. Opens 16 – 17″ away from door. We are taking orders now. Call 800-749-9609 or Order online today!